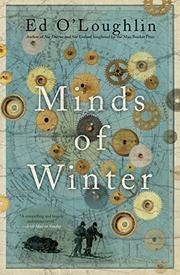 A massive, complex novel about a long-lost chronometer. In O’Loughlin’s (Top Loader, 2011, etc.) acknowledgements, where he lists the prodigious amount of research that went into his novel, he describes the book as “a self-indulgent mess of cobbled-together myth and mystery.” He began with a 2009 British newspaper article about the Arnold 294, a high-precision navigational chronometer that was taken on the unsuccessful 19th-century Franklin expedition to discover a Northwest passage and was believed lost but which had turned up in Britain 160 years later, converted into a carriage clock. How could this be? Like the “meshes of a net,” this is the first of many narrative threads woven through O’Loughlin’s labyrinthine tale. The main story involves Nelson Nilsson and his present-day search in the fierce cold and snow of the Arctic Circle for his missing geographer brother, Bert. He’s soon joined by an Englishwoman, Fay Morgan, who needs help in her search for her missing grandfather, Hugh Morgan, a former apprentice to Cecil Meares, the dog handler for Scott’s 1910 expedition to Antarctica. Then we’re in 1841 at a festive ball being held on the decks of the expedition’s two ships, the Erebus and the Terror. Set on three continents, the novel moves back and forth in time, mixing in fictional and historical figures. On this voyage, you’ll encounter the explorer Roald Amundsen; the Mad Trapper of Rat River; and Jack London. Also making appearances are northern Canada’s Distant Early Warning system and World War II Nazi meteorological stations in Greenland. At one point Nelson and Fay realize their separate searches are actually converging. Make a list of characters and keep it handy—maps are provided—to navigate this atmospheric, far-reaching novel. It may all be too much for some readers. A tour de force juggling act of narrative legerdemain.